How Is Human Interaction Motivated, Coordinated, Governed, and Evolved? Variations – new combinations – which prove useful provide the foundations for adaptive renewal. Useful variations that enable adaptive renewal can be a response to change in circumstances or can initiate change in circumstances, such as new products, processes, and business models that drive progress in the struggle to survive and flourish on a global commons with limited resources. In the creative competition for performance and renewal, effective managerial leaders influence people to contribute to a range of generic common purposes and an infinite variety of 4P outcomes: quality of life for people in producing and consuming goods and services; adaptive innovation that sustains and renews progressive change for people, profit, and planet; competitive productivity in producing and distributing goods and services at a profit; and sustainable consumption of the earth’s raw materials and stewardship of ecosystems. Effective leaders exercise the reciprocal influence that engages people in action for common purposes and mutual benefits in contingent circumstances. Leaders enable common purpose outcomes by establishing DEAR outputs: the common goals, values and identity required for shared direction; energising reasons for contributing to action; alignment and coordination of information, decisions, and activities across the different roles and contributions of individuals and groups; and relentless reflection on processes, results, and mental models and learning from them to harness and initiate continuous variation and renewal in coordinating and evolving collective action for common purposes and mutual benefits. This is the what of managerial leadership. The processes of goal setting, working together, and staying together define the how of managerial leadership. These processes apply across all contexts of leadership: frontline delivery; operational systems; strategic market position; and institutional legitimacy. All aspects of these processes are informed by the evolving dynamics of cooperative and competitive relationships in the implementation and innovation tasks of competitive performance and renewal. This original synthesis of robust findings from organisation and leadership science provides the basis for a range of powerful tools, initiatives, and programmes to support organisations, teams, and individuals in developing, deploying, and renewing continuously their leadership capabilities in order to survive and flourish in the new era of business. 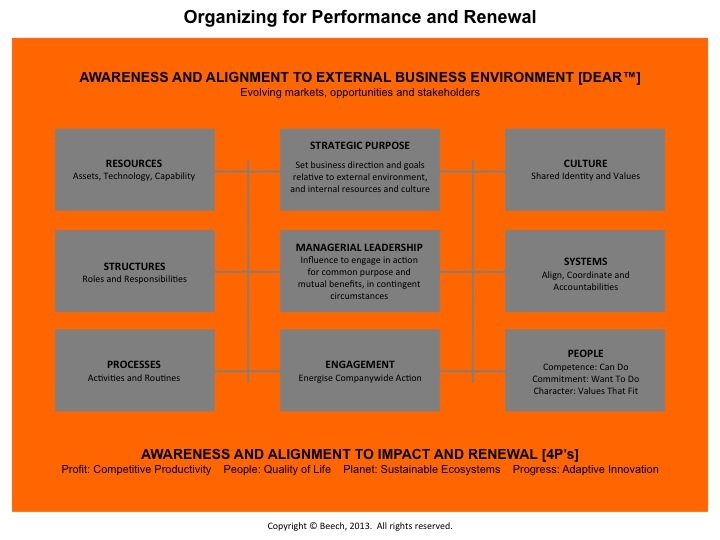 Organizing for Performance and Renewal is an original framework created by Cambridge Leadership Development that enables sustainability and competitive renewal for businesses in the 21st century. Achieving a continuously evolving balance across the competing requirements of a quadruple bottom line of profits, people, planet, and progress in globally competitive markets. A 21st century emphasis on purpose, processes, and people to complement and develop the 20th century emphasis on strategy, structure, and systems. This includes increased attention to the process routines that generate core capabilities in utilising and developing technologies. Increasing attention to engaging people to do willingly and well what needs to be done across cooperative and competitive networks within and beyond the enterprise. McKinsey found that ‘great companies create great meaning’. Establishing, sustaining, and renewing both common values and standards of behaviour and a sense of group membership and group identity are accepted as basic ingredients for enduring success. Acceptance that leadership is the decisive factor in promoting common values and group identity. More than this, the leadership role of managers is fundamental to engaging people and to coordinating people, resources, and activities for a common purpose in order to deliver mutual benefits for stakeholders. Managers and their networks of colleagues, associates, and direct reports are responsible for achieving the strategic purpose of their part of an enterprise for the mutual benefit of stakeholders. How well do you and everyone you work with understand the strategic purpose of your part of the enterprise? To what extent do you and everyone you work with see a link between your day to day activities and the strategic purpose of your part of the enterprise? How aware are you of the changing globally competitive context and the implications of these changes for you and your colleagues? What resources, assets, and technologies do you draw on to support you in achieving a high performance impact? What are the critical tasks, processes, and routines in your area of responsibility? Who is involved in your area of responsibility? What are their skills, motives, and values? How are activities and processes coordinated in your area of the enterprise? How is coordination between processes achieved across the network of relationships through which strategic purpose is progressed? What systems do you draw on to keep performance on track? What do you do to enable continuous improvements in performance? What are the links between common values and standards of behaviour and your leadership contribution? What do you do to engage people in a common purpose for mutual benefit? How well do you establish structure? How well do you ensure mutual respect? What contribution do you make both to initiate change and to adapt to change? What do you do to involve people in decisions about the ends and means of action? What do you do to mobilise and develop people so that they add value to enterprise performance? How well do you and everyone you work with understand the impact of your efforts on the relationships between employees, customers, financiers, and other stakeholders? What do you do to learn from the impact you have? If you had the authority what would you do to improve the coordination of people, resources, and activities so that the enterprise had more of an impact on stakeholders? To discuss how this framework could be applied to your organization, please contact us. In some quarters profit is a dirty word. Yet without profit activities are not sustainable. The leadership challenge is how profit is generated and how it is distributed. Continuous innovation in the production and distribution of goods and services at a profit is the foundation of modern societies because it enables quality of life for more and more people; however resources are always limited in relation to wants. Effective and thoughtful leadership from people in all areas of activity is slowly and steadily accepting responsibility for producing the competitive productivity and profits, quality of life, ecosystems sustainability, and progressive innovations that make life in our global village worthwhile, enabling – profit, people, planet, and progress – the 4P outcomes that define the good life. To achieve 4P outcomes effective leadership is essential at all levels across the business. Effective leaders establish and gain commitment to ‘company values’ that are based on goals and direction that are consistent with the business strategy, for every part of the organisation. Their passion, commitment and communication skills energise people to engage in actions that coordinate the cooperative alignment of company wide implementation activities that deliver strategic goals. These leaders also sponsor and proactively contribute to methods of achieving continuous learning that is reflective, and creates a culture of improvement, change and renewal. 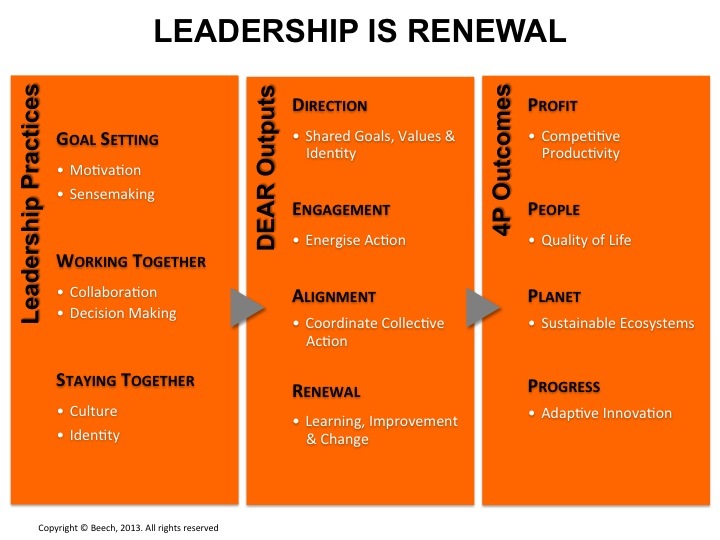 Effective leaders achieve – Direction, Engagement, Alignment, and Renewal – DEAR outputs enable 4P mutual benefit outcomes. Every day learning and knowhow happens naturally in the activities of people throughout the company. Sometimes it is not noticed or acknowledged as an asset, but quietly it drives continuous incremental change extending to customer and supply chains, and competitor networks. Effective leaders sponsor and promote this learning, proactively encouraging sharing, so that everyone from the reception desk to the executive desk has the opportunity to make a contribution to change, which may be radical over time, e.g. developing a new business model or strategy, new brands, or a new employment identity. 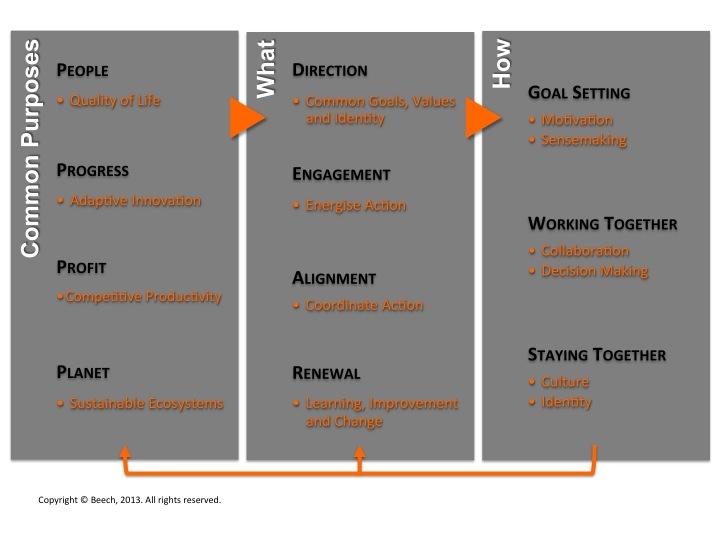 This is the source of companywide engagement, commitment, alignment and renewal that delivers significant added value throughout the business. Successful companies know that developing the leadership capabilities of their managers is a constant, not a one off event. When companies embed a leadership development strategy into their business strategy they derive the maximum impact from their investment in those people: successful implementation of their business strategy throughout the company. One of the fundamentals for successful team working is being clear about the purpose of the team, however clarity is not enough to successfully deliver the business outcome required. Some teams are teams in name only, they are simply individuals who sometimes come together physically or online, and have no common purpose or meaningful bonds that tie them together. The first and most crucial task of a team is to actually become a team. A Team Kick Off Session is an Effective First Step for Individuals to Become a Team. It provides the opportunity to communicate the purpose of the team, and how it’s goals fit into the overall business strategy. Sharing the core outcomes expected of the team is crucial together with explaining specifically what the team will collectively be held accountable for. In our work with clients we have found that following this briefing by facilitating a brainstorming activity focused on how to capture and monitor achievements and collective accountabilities creates energy, collaboration and ownership. This initial task is interactive and every input should be captured and positively received, encouraging contributions from everyone and demonstrating mutual respect, as well as stimulating innovative thinking. It also establishes the expected working practices of mutual respect, co operation and a willingness to work together. This task focuses minds on deliverables, and channels inputs in the direction of bottom-up, rather than top-down. This approach automatically identifies gaps and anomalies, and in so doing achieves alignment of efforts across the whole organization at all levels. Another benefit of this exercise is it also identifies where feedback loops are needed to allow for refinement in processes and monitoring. Each person on a team is committed to the need and purpose of the team, they respect the other members of the team, sharing and contributing constructively with the other team members to achieve their shared team goals. You may have extremely talented individual contributors, however each of them need to agree to being a member of the team, sign up to the purpose of the team, respect other team members as well as themselves, and work together positively, committing their unique talents to delivering the team’s shared goals and outcomes.